Finally, Apple has released the most awaited OS X Yosemite 10.10.2 Update (Build: 14C109) for Mac operating systems, and it’s a second major update of OS X 10.10 Yosemite. All general users of Mac OS X can upgrade / update / install the latest available OS X 10.10.2 Update. The official Direct Download Links of Final OS X Yosemite 10.10.2 Setup / Update (Combo / Delta) .DMG Files are posted below. 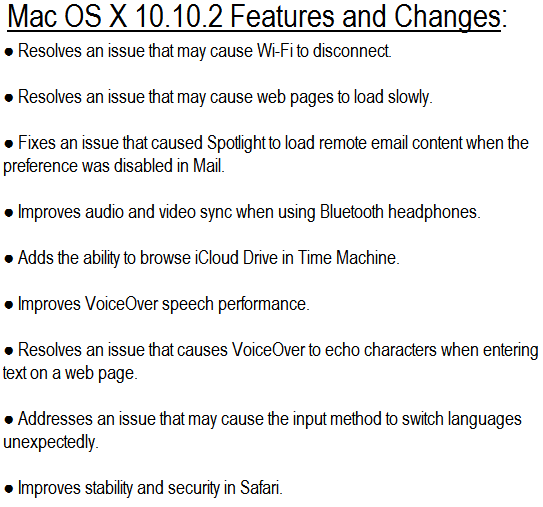 According to the release notes of OS X Yosemite 10.10.2 Final Update (14C109), Apple has brought several new changes in features and functionalities such as; bugs fixes, mail, Bluetooth, voice-over, Wi-Fi improvement, performance enhancement, compatibility, stability and security fixes and lots more as mentioned in below image. Click Here to read full changelog of OS X 10.10.2 Update. Apple has also released Safari web browser final update and important Security Update 2015-001 i.e. Safari 8.0.3 for OS X Yosemite v10.10.1, Safari 7.1.3 for OS X Mavericks v10.9.5 and Safari 6.2.3 for OS X Mountain Lion v10.8.5. 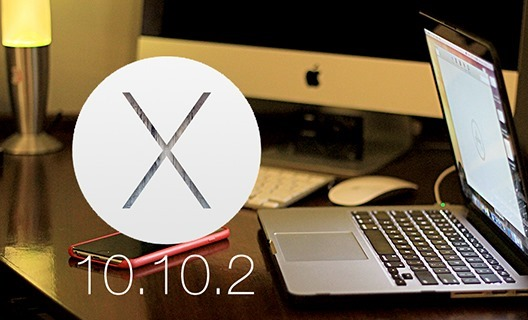 How to Install OS X 10.10.2? All Mac users can automatically receive OS X Yosemite 10.10.2 Final Update (14C109) via Mac App Store >> Software Update option. Whereas, Mac OS X general public (non-developers) and developers can also install OS X 10.10.2 via iTunes for manual installation through Bootable USB and Bootable DVD for Free after Download OS X Yosemite 10.10.2 Final Setup / Update (Delta / Combo) .DMG Files via Direct Links. Click Here to follow official Apple guide.